I get a lot of questions concerning the bulking and cutting strategy. Specifically, if someone is on the right track when they are bulking or if they should start cutting. 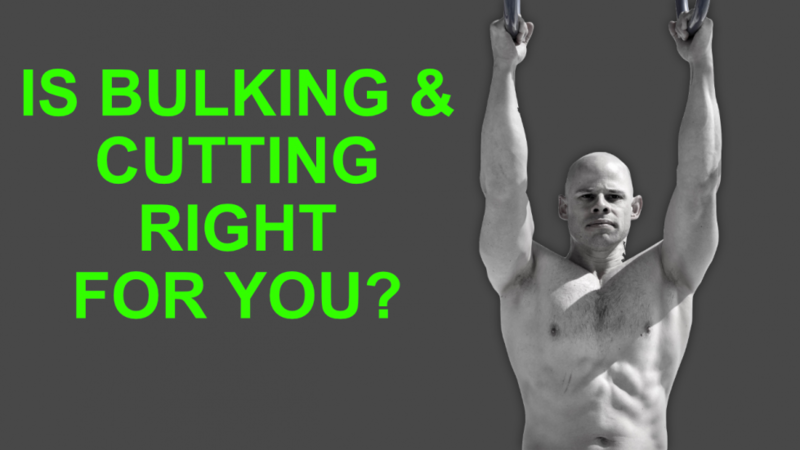 Some people also ask if they should bulk first and then cut or cut and then bulk. It may not surprise you, but I’m not a very big fan of the bulking and cutting strategy as a whole. It makes a lot of sense for those who are trying to optimize their physique for a competition or photo shoot. Outside of those specific applications, I don’t think it’s a practical approach for those who are looking to be healthy and improve their quality of life. The reason is simple, both bulking and cutting require a lot of dedication and discipline. You spend several months eating a lot of food and training your tail off to build as much muscle as possible. Then, you spend several more months trying to restrict your diet while usually doing a lot of cardio. Both of these scenarios can be very stressful and are high maintenance activities. Couple this with the fact that a bulking and cutting strategy is meant to make you look your best for a short period of time. The finished product isn’t usually meant to be an incredible physique you maintain for long periods of time. Again, this makes a lot of sense for a competitive bodybuilder but it doesn’t make sense to spend several months preparing to look good for a couple of days. If you want to build muscle or lose weight I recommend taking more of a general approach with your diet and exercise habits. Be sure to have a stable and consistent diet consisting of mostly whole foods and making sure that you get some protein and plants at each meal. Keep your portion sizes in check so that you satisfy your appetites without overeating. This will ensure that you eat enough to fuel your workouts and recovery without adding extra calories that will just turn to fat. On the work outside the same general rule applies. Keep a consistent training routine that covers all major muscle groups 2-3 times per week and work your muscles to a high state of fatigue in each workout. be sure to keep a work out log so you can track your workouts and ensure that you are making progress from one workout to the next. I know these simple tips are not too extreme or fancy and that’s just the point. You’re not trying to accomplish extreme transformations or look your best for a short period of time. These tips are about giving you the best chance of making consistent progress and achieving results that you can maintain for years to come with a minimal amount of effort. When it comes to getting in shape to live your best life, I can’t think of a better strategy than that.